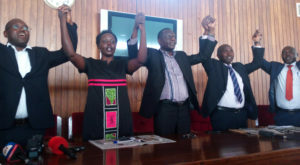 L-R: Wilfred Niwagaba (Ndorwa West), Monica Amoding (Kumi Woman), Felix Okot Ogong (Dokolo county), Theodore Ssekikubo (Lwemiyaga) and Barnabas Tinkasimire (Buyaga west) during the press briefing. Photo by Vincent Kasozi. KAMPALA–NRM MPs opposed to the removal of the presidential age limit have called upon Investment minister Evelyn Anite to resign. The MPs were responding to remarks made by the minister yesterday in which she stated that she had the support of the army in her push to amend Article 102(b) of the Constitution. “She should resign and if the President does not dismiss her, it will confirm that he is the one sending these people,” Workers MP Sam Lyomoki told a press briefing this afternoon. The MPs were led by the Kumi Woman MP Monica Amoding who branded Anite’s statement as reckless, noting that it was unnecessary to drag the army into a civil debate over the transition of power in the country. She stressed that the move to lift the age limit was not a position of the NRM but was being championed by a few individuals of the party at the expense of the majority. A section of NRM MPs who met on Tuesday in a hastily arranged party caucus meeting passed a motion for the Igara west MP Raphael Magyezi to present a private members bill aimed at amending the Constitution in order to remove the upper age cap of 75 years for presidential aspirants. This would effectively give President Museveni license to rule for life since there would be no constitutional obstacle preventing him from contesting for the presidency as long as he still lives. President Museveni is currently ineligible to run during the next general election in 2021 since he would be over the constitutional age limit of 75. Amoding marshalled several MPs today to denounce Anite’s remarks. She was flanked by seven other MPs, including Barnabas Tinkasimire, Theodore Sekikubo, Wilfred Niwagaba, Felix Okot Ogong, John Baptist Nambeshe, Patrick Nsmaba and Lyomoki. Felix Okot called on Anite to withdraw her statement and urged the army to come out and disassociate itself from her remarks. The Lwemiyaga county MP Sekikubo labelled Anite’s remarks as treasonous and said Anite and all those who support her should be behind bars. “A member of cabinet is trying to incite the army to take over a constitutional order….. Yes we know the President is the Commander in Chief but that does not give license to the ministers to be reckless and incite the army,” he said. Sekikubo equated Anite’s statements with the 1966 constitutional crisis when the army surrounded Parliament and MPs were forced to pass the 1966 pigeon hole constitution. “Nobody can use the army against the people of Uganda. The people are the sovereign not the army,” he said. The MPs disclosed that they have suspended all foreign trips and other business outside Parliament and will continue to monitor proceedings in the House closely such that they prevent the private members bill seeking to amend the constitution from being sneaked in. “Some of us have a lot of other engagements but we have agreed that we will have to be in Parliament daily because we cannot allow any under the table manipulations,” Lyomoki revealed. The Manjiya County MP John Baptist Nambeshe noted that he had support to collect enough signatures to move a censure motion against Anite. Reports indicate that cabinet has approved plans to provide a certificate of financial implication for Magyezi’s private members bill. Armed with this certificate, Magyezi will be halfway towards the finish line.